The purpose of this document is to provide a way of creating incremental drop script with respect to destination database without any manually intervention in the DB project. 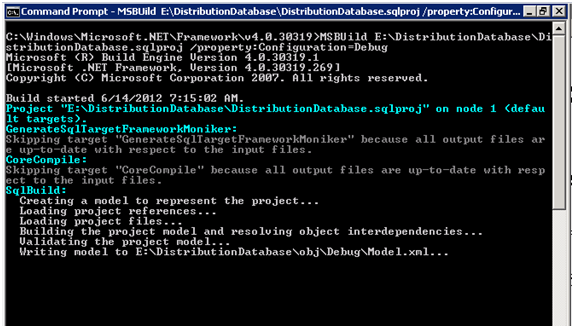 We are utilizing MSBuild and SQLPackage utility to create incremental drop script. SQL Server 2012 DB project always create/refresh“.dacpac” file whenever we build the project. The .dacpac file extension stands for Data-Tier Application Schema File Format Structure Specification. A .dacpac file consists of a package of XML parts that represents metadata of the data-tier application and SQL Server object schema. 1. Take the latest SQL DB project from VSTF location- $/MyVSTFServer/DistributionDatabase and copy the project to appropriate location e.g. E:\DistributionDatabase. 4. Now we need to create drop script with respect to target database. 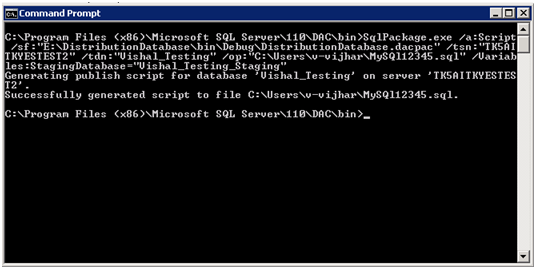 Here we are using SQLPackage utility to create the script. Go to the directory where sqlpackage.exe resides. SqlPackage.exe /a:Script /sf:".dacpac file location" /tsn:"Target Server" /tdn:"Target DB" /op:"path for output script file" /Variables:StagingDatabase="Staging DB Variable value "
e.g : SqlPackage.exe /a:Script /sf:"E:\DistributionDatabase\bin\Debug\DistributionDatabase.dacpac" /tsn:"TK5AITKYESTEST2" /tdn:"Vishal_Testing" /op:"C:\Users\v-vijhar\MySQl12345.sql" /Variables:StagingDatabase="Vishal_Testing_Staging"
Note:: We can use variables also in the command line. Below screenshot showing “MySQL12345.sql” is created. Below fig showing deployment script. 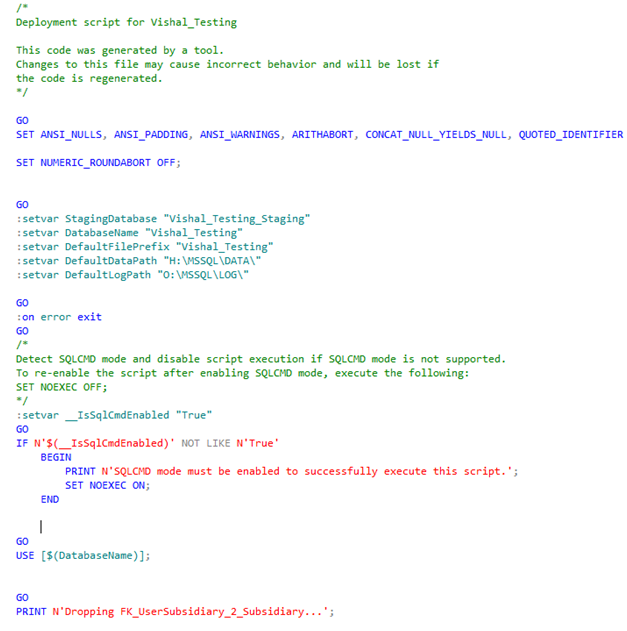 The below script showing empty file as we have not changed anything in the solution. If we do any changes in the project solution then only those changes will reflect in the incremental drop script. By using above mentioned steps, we can create drop script (incremental) with respect to target database. The deployment script will contains all the DB objects which are not available in target DB or recently updated in the DB project.